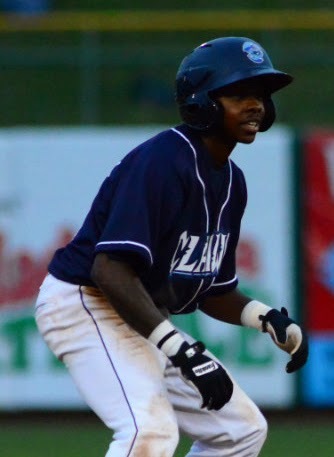 Selected in the 2nd round of the 2011 draft out of Port St. Joe High School, speedster Roman Quinn was immediately a prospect that many thought would be on a fast track upward in the Phillies system. Hampered by injuries last year, it could be a difficult road back for the athletic shortstop. Listed at five feet ten inches tall and weighing 170 pounds, Quinn showed great improvement during his first year as a pro. After signing late, he did not play in his first official minor league game until 2012. With short-season Class A Williamsport, Quinn sported a .281 average with nine doubles, a league-leading 11 triples, one homer and 23 RBI while swiping 30 bases in 36 opportunities. Those excellent offensive efforts came while learning to switch hit and adapting to a defensive switch to the infield after playing mostly outfield in high school. Comfort was a big factor for Quinn in 2013, according to his Class A Lakewood coaches, who saw things get easier for him at the plate as the season went on. Quinn opened last season as a 19-year-old. He got off to a rough start, batting .202 with a .556 OPS in 22 April games. In May, things began to look up offensively for Quinn as he tallied a .304 average with an .874 OPS in 26 contests. His season would not last much longer, as the Florida resident was hit by a pitch that resulted in a broken left wrist in June. He wrapped up his 2013 BlueClaws campaign sporting a .238 average with seven doubles, three triples, five home runs and 32 stolen bases in 41 chances through 67 games. Unable to compete in the Florida Instructional League, due to the slow healing wrist, Quinn continued to work out and suffered a ruptured right Achilles while running sprints in the autumn. Surgery to repair the issue came soon afterward and Quinn is expected to miss the majority of the upcoming season. Quinn, who is a natural right-handed batter, displays gap power from both sides, as he strives to improve his switch-hitting ability. Quinn's walk rate (9.1% in two pro seasons) has been quite good, considering his age and other hurdles. As his experience increases, so should his ability to draw free passes. His strike out rate (20.6% as a pro) is evidence there's room for improvement with making contact, which the Phillies are confident will come as Quinn gets more pro at bats. At the plate, Quinn has also worked steadily on improving his skills at bunting, which could be a big tool for him going forward, based on his quickness. On the bases, Quinn was among the fastest players in the minor leagues prior to his Achilles injury. He was regularly praised for his skills at beating out grounders for hits, stealing bases with ease and taking extra bases where others would not be able to. Quinn told me during an interview this off-season that he has no worries about the recovery process or the ailment possibly having a lengthy impact on his career. He's focused on rehabbing and training toward a full recovery. Defensively, Quinn has a strong arm and has shown considerable improvement with the glove and throwing accuracy as he has progressed in the developmental ranks. At times, frustration has gotten the best of Quinn, who has steadily battled with focus while changing positions and he has seen one error snowball into multiple errors in games on occasion. Some scouts project that Quinn will return to the outfield, especially with another fast-rising shortstop prospect, last year's top pick by the Phils, J.P. Crawford, now in the mix. Playing under former Phillies All-Star Mickey Morandini, who managed Lakewood last season, was very helpful in allowing Quinn to develop his defensive mindset and adjust to the infield, according to Quinn. The 20-year-old possesses the raw tools to potentially be an impact player in the big leagues one day and would likely spend time back at Lakewood in the latter portion of the 2014 season, if his recovery goes well. Quinn is already ahead of schedule and is targeting late-June or early-July for a return to game action. Click here to view the running list of this year's countdown.